This delightful early Victorian cookbook allows today's cooks, readers, and food-lovers to enter the intriguing world of the mid-19th-century homemaker. Written by Sarah Josepha Hale - best known as editor of Godey's Lady's Book - it's designed to "promote the health, comfort, and prosperity of American families." Readers will also find instructions for preparing scores of tasty and economical dishes, including traditional classics such as broiled salmon, squash pie, sweet potato pudding, beef stew and homemade bread. Early American Cookery is supplemented with helpful hints on how to keep meat fresh during the winter (before modern refrigeration), how to smoke hams and fish, wash carpets, remove fruit and wine stains, clean marble and brass, treat earaches and sore throats, and much more. 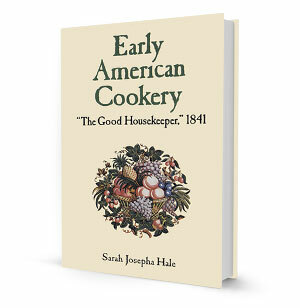 If you love historic cookbooks and getting a glimpse into a bygone era, then get this book! Designed to promote the health, comfort, and prosperity of American families.